It’s hard to seem invisible when you’re 6’ 9” tall. But for still photographer John Medland, success depends on getting the perfect shot on a film set without anyone knowing he’s there. 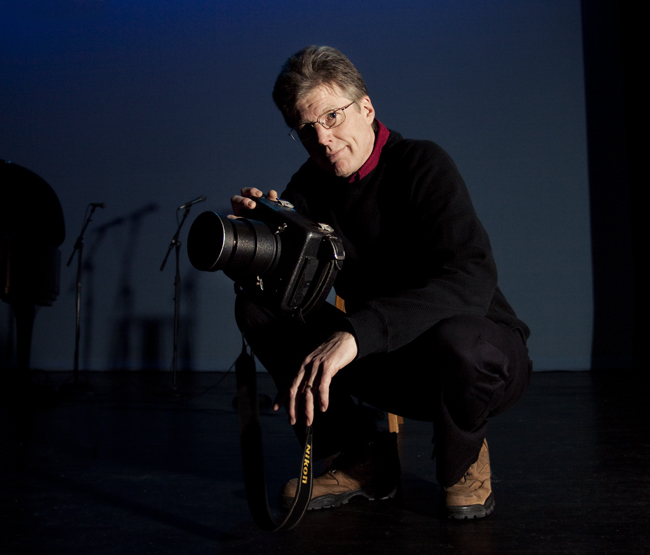 “You don’t want to be on the soundtrack, and you certainly don’t want to show up in the movie,” explains Medland, 57, who has photographed more than 100 productions, from Disney’s Camp Rock and Camp Rock 2 to X-Men, PCU, and the Road to Avonlea TV series. His job is to capture action shots that can be used in promotional materials like posters, websites, and DVD jackets. Finding that perfect angle is tricky, especially when he towers above the stars. Until recently, Medland was based in Toronto, the third-largest center for film production in North America. When his wife, bassoonist Kathleen McLean, was offered a position with the IU Jacobs School of Music in 2009, the family moved to Bloomington, and Medland took on a 12-hour commute. “You’re just a bag of crap when you finish that drive,” he admits, but since post-production can be done from anywhere, the arrangement works out. In addition to the artistic satisfaction of taking beautiful pictures, Medland says schmoozing with the stars is a real perk. “It’s exciting, I still get a thrill,” he says, naming Shirley MacLaine, Harvey Keitel, Timothy Hutton, and Anne Archer among those with whom he’s worked. Even when he’s getting the cold shoulder—Lynn Redgrave once complained of his presence on the set, “I’m having a great deal of difficulty ignoring you”— he says he still walks away with a great story.